Even though the weather was a bit windy and gloomy last night I went out to finish the photography for this blog post I had been planning about the beaches on Herm Island. The first place I went to is a location I call 'viewpoint' and it's where, at low tide, you can clearly see both Belvoir and Shell beaches in the distance. Unfortunately last night was high tide so I need to revisit this shot! Viewpoint is actually located along the cliff path to the south of the island where there are enough views for a blog post of their own. However that path is not somewhere you want to be on these windy evenings so I turned back off the cliff path to get some better photos of Belvoir Bay. Belvoir Bay at high tide. 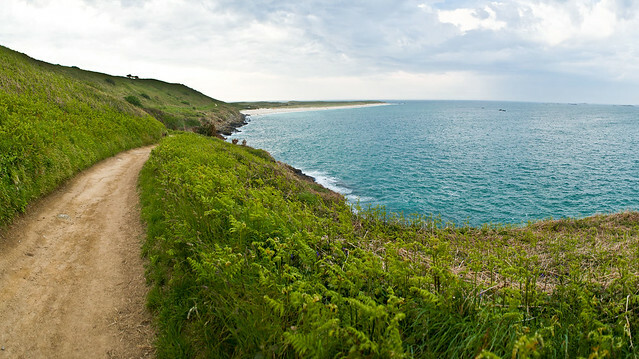 The walk between Belvoir and Shell is my favourite on the island and I am so lucky to have to walk it most days. I love the way the beach of Shell seems to gently blur into the sea, bright white and bright blue and I remember how clear it was to see from Sark. Here you can see my path to work! Closer to Shell you can now see the cafe and the kayaks for hire. You can see Sark in the distance. 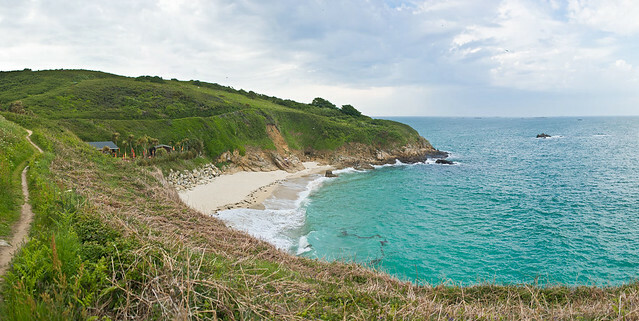 So even though Shell and Belvoir are the beaches to be seen on Herm, they are not the only ones. On the west side the beaches are called Fisherman's and Bears and I found a great view location in the meadow to get them both in a picture. You can also see our neighbour island of Jethou and the edge of Guernsey in the distance. And then the north of the island is also a beach called Mouisonniere but high tide makes this virtually disappear but I took this lovely image looking towards the north beaches. So those are my pictures along a beach theme... there is still so much to photograph here and thankfully I still have a few months to do it in! Don't forget if you click one of my images to take you through to Flickr you can get a bigger look!